Writing about the Club on page 212 of Grandmasters of Chess (Philadelphia and New York, 1973) Schonberg had not made the mistake about Capablanca and Alekhine. 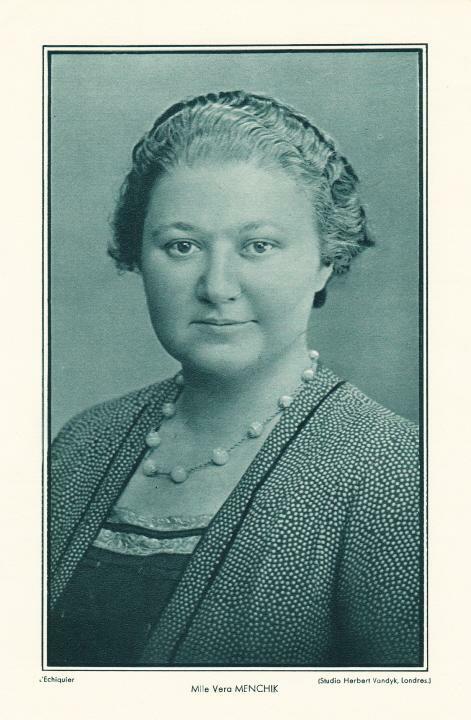 Chess writers seldom compose more than a few lines about Vera Menchik without mentioning that male players defeated by her became, ipso facto, members of the Vera Menchik Club, but what is known for sure about the origins of this cardinal component of chess lore? Tartakower (a participant in Carlsbad, 1929) wrote a few lines about the Menchik Club on page 70 of Neue Schachsterne (Vienna, 1935), but without indicating who had originated it. See too pages 6-7 of Chernev’s Wonders and Curiosities of Chess (New York, 1974). ‘We know that Vera included in her list of victims the names of a number of reputable masters forced, in one contest or another, to bite the dust. For reasons undisclosed, the account of the Club on page 237 of Impact of Genius by R.E. 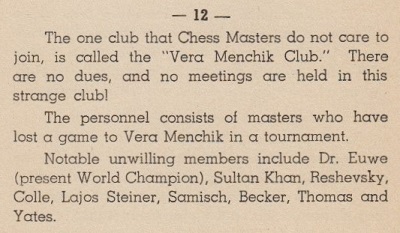 Fauber (Seattle) asserted that Vera Menchik ‘outraged the male players by accepting an invitation to the great Carlsbad, 1929 tourney’. In reality, Vera Menchik finished alone in bottom place at Carlsbad, 1929, three points adrift. Neither Pirc nor Ståhlberg played in the tournament. At Carlsbad, 1929 Vera Menchik lost her game against Edgard (not Edgar) Colle, played on 15 August 1929 (see page 260 of the tournament book). In June she had defeated him at a tournament in Paris (L’Echiquier, July 1929, pages 290-292).